Here is a new Exhibition of Jean-Michel Saive with Benjamin Rogiers end July 2015 ! The show is 33 min long, enjoy ! Waldner and Persson Show Training ! Here is a short video from the full Training footage ! Amazing to see them play, great feeling. Amazing old school Exhibition in 1990! What do you think of this old school exhibition Betwer Jacques Secretin and Vincent? Insane Exhibition between Timo Boll and Jorgen Persson 2016! 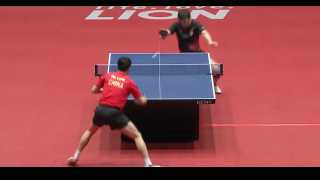 Ma Long vs Xu Xin Exhibition Match 2016! Jan Ove Waldner Exhibition Top 10 Points! Maybe the last match between these two players... Jan Ove Waldner and Philippe Saive backstage at last years ITTF Legends Tour playing match! Jan Ove Waldner and Persson - Mini Table 2015! Amazing exhibition point by Boll and Persson! Bayern München FC vs Ding Ning & Wang Hao! Ma Long & Xu Xin Exhibition 2013!